I’ve been a consultant at some larger, older clients. I’ve noticed that, by and large, there are effective leaders and individuals at older organizations, but in reality, the culture of those older organizations tends to be more slow, monotonous, and a little too comfortable. Each large company has a specific purpose that they’ve become accustomed to, and they tend not to like change, as it is inevitably disruptive and forces them to take risks. There are exceptions to the rule. There are extraordinary individuals even at failing, old, decaying organizations. But to determine the efficacy of an organization's technology, you have to review the history of that organization. What about Google? Apple? The culture of these organizations is change itself. The only constant is that new technology is constantly evolving, and Silicon Valley companies – and good tech companies in general – understand that part of the equation. They know that a modern company can never stand still and rest on its previous accomplishments; it must constantly innovate to be the best at doing what it does – whether that’s a search engine, an operating system, a smart phone, or in Ripple’s case, payments. In Ripple’s case a very high proportion of its staff are technology developers. This means that the company likes to build things – and build good things: Effective things: Amazing things. XRP allows banks to do cross-border transfers of value faster and cheaper than today’s old system, by removing the traditional nostro account and replacing it with an option to use XRP as a bridge asset for cross-border currency transfers of value. This technique has been shown to reduce banks’ costs by up to 60%, even if XRP is going through a period of high volatility. SWIFT, the 44-year-old organization established in 1973 to standardize electronic transfers between banks, has consistently stood back and taken a “wait-and-see” attitude towards any new technical solutions for cross-border transfers of value. 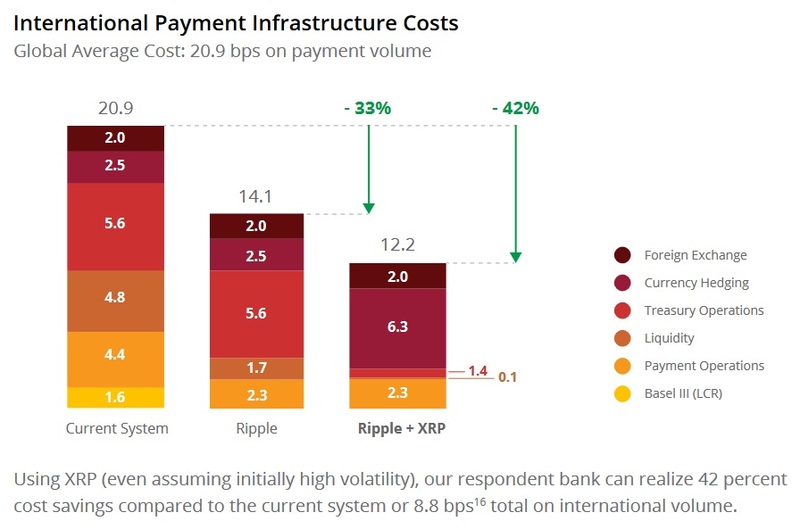 Ripple, in 2016, published a scathing review of SWIFT’s efforts to upgrade its current cross-border system of payment transfer using modern technology; SWIFT was basically proposing to make components of their existing system faster, but not to recommend any dramatic changes in its processing approach. Their proposals did not involve ending Nostro accounts, and most notably, there was initially no mention of using a modern distributed ledger technology – originally. Then Ripple published their review, and recently SWIFT has changed its tune to now indicate that they are looking to use distributed ledger technology, at least as a solution to part of the value transfer steps between banks – storing the nostro accounts in a way that makes reconciliation much easier. But these efforts are window dressing. SWIFT is not proposing a replacement of nostro accounts, and has gone out of its way to never once mention its competition in this space – Ripple. That amount of silence speaks volumes. Payment pre-validation and Fee pre-disclosure: Using Ripple’s XRP Ledger, before a value transfer is done, both parties agree to terms, and the ultimate cost of the transaction is then known and agreed-upon. SWIFT messaging is unidirectional, and banks don’t know the full cost until the transaction has completed. This puts SWIFT at odds with regulations such as Dodd Frank 11 and PSD2 12, which require pre-disclosure of fees and FX rates. Interoperability and Scalability: The inter-ledger protocol - the XRP ledger’s method for communicating with other ledgers - can scale horizontally in an unlimited fashion, processing extreme transaction volumes. 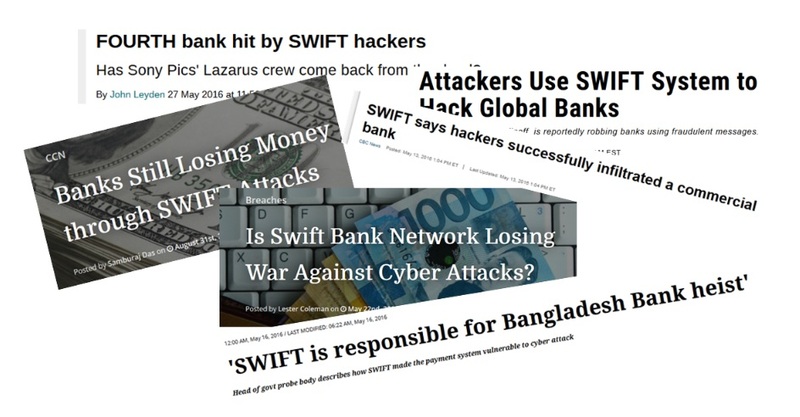 SWIFT is proposing a closed interbank network. Liquidity Management: Ripple’s XRP Ledger gives banks the flexibility to either build and use their own liquidity, or tap into the existing markets for currency on the XRP ledger, including the possibility of using XRP as a bridge currency. SWIFT requires banks to use their own liquidity denominated in fiat only. In the meantime, Ripple has built the payments equivalent of the Tesla Model S.